In the wake of their highly successful third full-length “Until Fear No Longer Defines Us”, which sold more than 4.000 copies in Germany alone, GHOST BRIGADE are now releasing a collector’s edition vinyl single containing a remix and an acoustic version of current songs. The remix for “In the Woods” turns out to be a fantastic electronic revisiting in the shape of a dark atmospheric Trip Hop experience. This version was created by Jonny Wanha, who recently won a stunning second place in the famous DJ Shadow remix competition: “Of all the remixes, Jonny’s entry wins the ‘it’s-stuck-in-my-head-and-I-can’t-stop-listening-to-it’ award”, commented the pioneer of turntablism. As a tasty bonus for their fans, GHOST BRIGADE include a previously unreleased acoustic version of “Soulcarvers”. 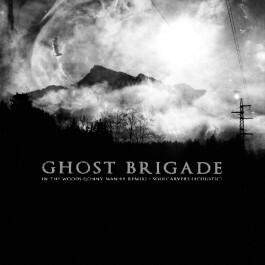 With their latest albums scoring soundcheck victories and best album awards in the end of the year lists in major magazines, high profile touring and festival shows, GHOST BRIGADE are a fast rising force in the European music scene.